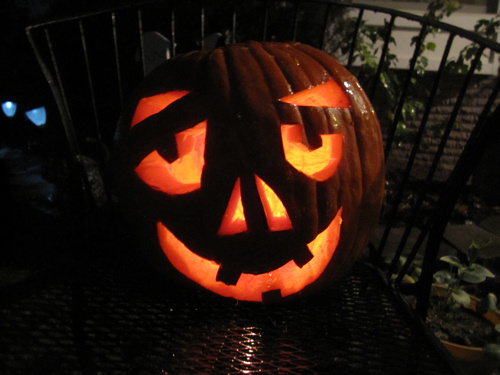 This Halloween, I carved two pumpkins; one with my preschool class and one with my daughters. The four year olds had mixed reactions about sticking their hands in the pumpkin to feel the “guts,” but both Lily and Emmy loved feeling the slimy seeds! I took the seeds home and roasted them, and then took them back to school so that the preschoolers could have a taste. Some of them didn’t care for the seed I gave them, but I made sure to thank them for trying something new. A few of the kids wanted to eat more of the seeds! One of the preschool moms had a taste, and she told me the seeds were perfect and wanted to know how I roasted them. Soak the seeds in salt water for 2-4 hours. I didn’t measure the salt, but I dissolved quite a bit of salt in warm water, and the water was cloudy. The seeds floated on the top of the water, so I stirred the seeds in the water every once in a while. Drain the seeds and pat dry. Mix with a small amount of olive oil and spread out on a cookie sheet. I used parchment paper on my cookie sheet to keep the seeds from sticking to the pan. These pumpkin seeds are just slightly salty, so if you prefer more salt, you could add it when you mix the seed with oil. Enjoy! They sounds delicious….I haven’t made any in a few years! I must be hungry, ’cause you have me craving pumpkin seeds like crazy! I find these to be delicious. I haven’t eaten them in years but my husband often roasts almonds with some spices, so I am sending this to him! Your Jack O’Lantern is cool! I have to admit that I’m very lazy when it comes to making pumpkin pie. I go for the canned stuff because I don’t have the patience to carve out a pumpkin and pull out all the seeds. Kudos to you for doing it twice! Angelina Costenaro recently posted…Are my Italian lessons paying off?